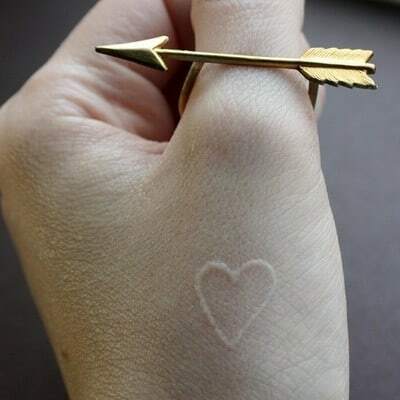 A white ink tattoo is a trendy tattoo that has its design done out of all white ink. The most glaring thing about a white ink tattoos is that it is subtle and does not stand out as much as a black tattoo on fair complexion. Colored marks also stand out more on white tattoos and for this reason – not many people would like to mix a white tattoo with another color. There are the sort of tattoos and body arts that people want to expose only when they are deliberately shown to someone. Discreet body arts are a good way to avoid some negative attention that is usually meted on people in the office place or any workplace. It removes the need to have them hidden during formal gatherings. Simplicity is usually a plus when body arts are concerned and white tattoos are more visible and identifiable when they stay on the simple design side. When somebody has a complex tattoo, it is hard to tell the design or shape and eventually, someone may think that he is looking at a bad skin disease case or a scar and not a tattooed person. Some good ideas for simple tattoos may be meaningful sentences, stars, kanji symbols and some tribal patterns. Tattoos of faces and famous legends are hard to get because white ink is trickier to look at when drawing the tattoo, making it require a very skilled tattoo artist to create. Also, you should remember that constant exposure of white (and eventually, every other) tatto to sun will have a damning effect on the tattoos and that will in turn lower their clarity. Constant sunshine will affect the tattoo in case the person is wearing revealing clothes or has not covered up the tattoo very well. Keep it away from the sun as much as you can and also select strategic spots to have the tattoo, for example the back and the chest areas. The shoulder or around the ankle areas are also good if you cover up well. Should I Mix Colors With White Tattoos? When a white tattoo design can easily get mixed up with other colors on the preparing level and designing, it will end up looking distorted. This is the reason why it is not advisable to combine a white ink tattoo with another color. Stay white and as suggested before, simple. Of course, it’s possible to create different design as well, for example Veni Vidi Vici tattoos using black tattoo ink. But, it’s different style. White Tattoos On Black Skin? The white ink does not absorb as quick as black ink does and as a result, when having the tattoos done, the artist usually passes over the same spot several times in order for the ink to really draw a noticeable pattern. Passing the ink over one spot multiple times is what helps it sink properly into the skin. The problem with white ink tattoos however, is that people with very dark complexion would have the tattoo look more transparent on their skin. It would not look anything close to a solid color and the case is worse when the person has freckles around the spot where he wants the tattoos done. 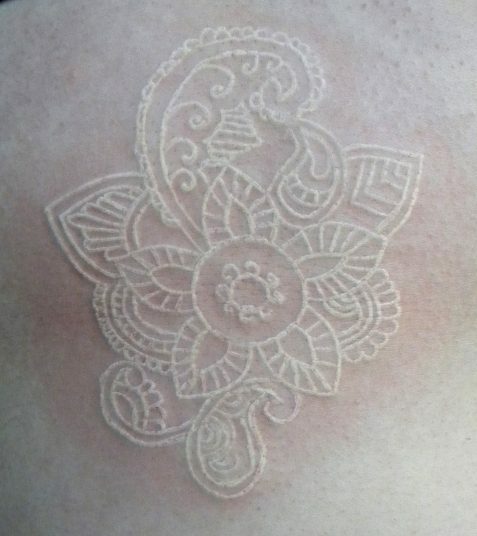 So, white tattoo will be much more visible on a pale skin. Do you got any question about white tattoo inks? Please leave us a comment.